and micro shear testing of gold single crystals. 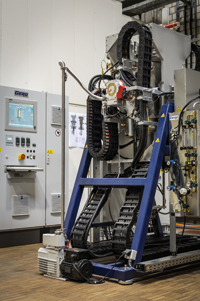 The ASG study group IDV is presently at the heart of a collaborative research centre on Ni-base superalloy single crystals funded by the German Research Foundation (DFG), SFB/TR 103 which started work in 2012. All three ICAMS departments actively participate in SFB/TR 103 where they promote the field of scale bridging modelling. 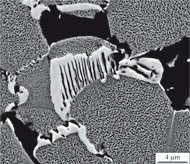 Microstructure of a Ti-Ta high temperature shape memory alloy after creep. Bridgman furnace, operated with the STKS department. 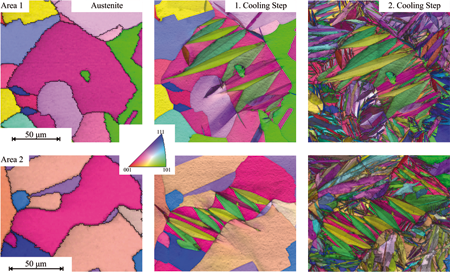 EBSD images showing the step-by-step martensitic transformation in the Fe-30 at.% Ni system.